What we call “Razz” is really just Seven Card Stud Low — think of a game of Stud where the lowest hand wins the pot instead of the highest. The object of the game is engaging for poker players, in that it’s different from most poker games but still uses the same game play. The poker pros say that Razz is easily one of the most frustrating poker games to play, though it is worth spending time on, considering that you may need Razz skills during HORSE tournaments or ring games. Razz is what is known as an “ante” game. In an ante game, all players are required to put in their ante before any cards are dealt. After the cards get laid out for play, Razz moves almost exactly like 7 Card Stud with a few major differences. In Razz, the highest up-card on third street is required to make a forced bet. This best starts the real action of the game — in every round of play after that, the lowest hand showing makes the first move. If there are any ties for low or high hand showing, the first active player to the right of the dealer starts the round’s action. Another big difference between Razz and 7 Card Stud is if a player pairs the door card, there is no double bet chance like you find in a standard game of Stud. As has been mentioned above, the lowest hand wins the pot at showdown. Aces count as low (lower than 2) and flushes and straights are ignored for scoring purposes. If the best hands in Razz are the “lowest” hands, what does that mean? Remember that straights and flushes don’t count against you in Razz and Aces are counted as the low card — the “ace”, or “one”. Here are the ten best Razz hands possible. I cannot emphasize this enough — Razz is a game of patience. 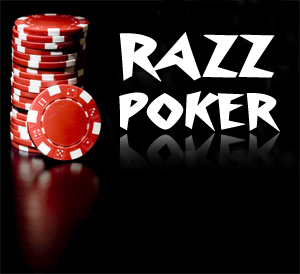 Razz can teach you to be patient in other poker games as well, and as such it is crucial to play a tight hand of Razz. The key to Razz is making what are called “ante steals” every time you have the chance. Ante stealing is important the higher up you go in limit, though it is important throughout the game. There are plenty of situations in Razz that are meant for attempts at ante stealing. If the bring-in player is sitting immediately to your left and the table is folded up to you, you should always (always!) complete the bet to steal the bring-in and all the antes. This is a money making play even if you aren’t successful every chance you get. Another good chance for stealing — when you are the lowest up card. We’d all prefer to have solid cards in our hands, but consider this steal attempt money in the bank. Even if you have the second highest up card folded to you in a late position, you can capitalize on this. However, this is where ante stealing gets tricky — the lower the limits you are playing the less sense this move makes. Remember your starting hand values — in truth, it is easier to understand Razz starting hands than any other game. If you hold three cards between Ace and five, you have a top of the pops starting Razz hand. A23 is the best starting hand, of course, but any three cards between Ace and five (without pairs that is) is a hand worth betting and raising with once you get the chance. If you hold a three card starting hand between Ace and six, you’re still blessed with a good starting hand and can safely play as aggressively as you need. Watch out for the other players actions in this case — if they have lower cards and are increasing their bets, back off a little. A hand containing three cards of seven or lower is a solid starting hand for Razz if you can wait for fourth street. Call a couple bets and let the game creep by a little before you make your move. Where you cross over into bad hand territory is an opening that includes eights or higher. Best bet is to steal antes at this level. You can lose lots of money in Razz by playing three card eight hands. This brings up another thought — how slow should you play? Conventional wisdom says you should slow down Razz as much as possible whenever you can. Really, though, Razz is not a game to grind into the pavement. In general, if you’re holding good cards, you should go ahead and slow the game down. Why? Slowing down will build the pot to a size that caters to your hand. By the time third street comes around and you’re holding good cards, you can call on fourth street even when you’re dealt that awful off. Don’t forget that you can get back on track with a lucky deal on the next turn. Watch for loose or overly aggressive players and use these weaknesses against them, they don’t have a place in the game of Razz. Remember also that simple betting and raising works well when you have good cards. Like the song says, in Razz you really have to know when to hold ‘em. Understanding the proper situation for a fold in Razz can be the difference between a fat wallet and a night spent washing dishes. Don’t play with bad hands and for God’s sake don’t take a bet on a weak hand against much stronger draws. If you do that, you’re the sucker at the table paying everyone else’s rent. The old poker adage is true here — if it looks like you’re beat, you are beat. Play your best hands and when you have them, play aggressively. When you’re playing a low limit game, the stakes are low and poker players tend to show their true colors, so calling bluffs becomes like breathing good air. I would suggest a strong dose of patience for Razz.